Shah's Lok Sabha poll debut from the Gandhinagar constituency will mark a generational shift in the party as this seat has been held by LK Advani since 1998. BJP president Amit Shah Saturday said the 2019 Lok Sabha elections will be fought only on the issue of who will lead the country after the polls. 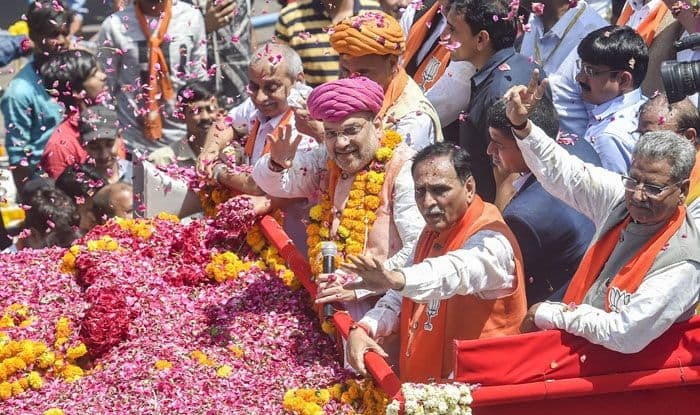 Addressing a rally in Ahmedabad before filing his nomination papers for the Gandhinagar Lok Sabha seat, Shah claimed that in Prime Minister Narendra Modi, people saw the leader they had been waiting for since the last 70 years. Union ministers Rajnath Singh and Nitin Gadkari and leaders of NDA allies, including Shiv Sena chief Uddhav Thackeray, SAD supremo Parkash Singh Badal and LJP founder Ram Vilas Paswan were present on the stage with Shah. “During my visits to different places in the country, I found people chanting only Modi’s name to lead the country,” Shah said. “This election will be fought only on the issue of who will lead the country… When I ask this question to people from Himachal to Kanyakumari and from Kamrup to Gandhinagar, I can only hear one sound — ‘Modi, Modi, Modi'” he said. “In Narendra Modi, people have found the leader they had been waiting for since the last 70 years,” Shah said. He said it was his “good fortune” to file his nomination papers from Gandhinagar, which has been represented by LK Advani, Ataji (AB Vajpayee) and Purshottam Ganesh Mavlankar in the past. The BJP chief’s Lok Sabha poll debut from the Gandhinagar constituency will mark a generational shift in the party as this seat has been held by Advani since 1998. The state BJP feels that Shah’s nomination will energise the party in Gujarat and help it win all the 26 Lok Sabha seats in the state.